Click on the bars below to all the subdivisions and condo & townhome complexes in Idaho Springs. You can also view the most popular searches such as ranch style homes, new construction, homes with a pool or houses with mountain views. Click to see Local Subdivision and Complex Maps. What is Your Idaho Springs Home Worth? Idaho Springs is a small town about 35 miles west of Denver on I-70. This beautiful place is home to many attractions and breathtaking scenery. Echo Lake Park, the Argo Gold Mine and Mill, and a short drive to Mount Evans are a few of the places that make this place an enjoyable place to live. Idaho Springs offers a sense of community as the small population allows people to be a part of a small town. There are many homes for sale in Idaho Springs, Colorado that will make your dreams come true. If you are looking for a wonderful place to live with a slower pace of life, then Idaho Springs is the perfect place to settle down. The famous Charley Taylor Waterwheel can be seen from the highway, and this figure transcends the unique gold and ore mining history that once ruled the area. Idaho Springs provides some great restaurants and shopping to enjoy. The Argo Gold Mine and Mill will take you back to the gold mining days of old as you see firsthand what an old mine looked like. 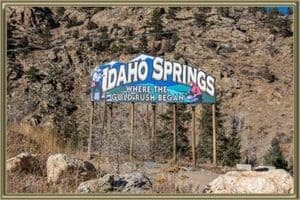 The homes for sale in Idaho Springs, CO will give you access to this historical community that has everything to offer. The road that leads to Mount Evans is the highest paved road in North America and climbs 14,200 feet above sea level. From the forested mountains, hiking trails, skiing, shopping, and Denver a short drive away, the community provides the best of what Colorado has to offer. The historical downtown district is reminiscent of an old mining town that still features buildings from the gold mining past. The Miner Street Bridge is one of the sights on the National Register of Historic Places. The Indians Springs Resort is home to hot mineral springs that are fun and relaxing for all. This resort provides many swimming experiences and amenities that will keep you coming back for more. Our Idaho Springs real estate agent can show you all this unique community has to offer. We show you the details on homes in Idaho Springs CO, subdivisions, an interactive community map, and all the things you can explore and see. Whether buying or selling, you can learn more about the current Idaho Springs real estate market trends and get a free personalized market report. The report will show you the market trends, find out which homes sold recently and at what price, see all Idaho Springs homes for sale, and much more. Call us at 303-325-5690 to talk to our Idaho Springs, CO real estate agent and find out more about the homes for sale in the Idaho Springs community. If you are looking for Idaho Springs homes for sale, we can help you find the perfect one. Thinking about selling your home? Get your Idaho Springs Home Value Instantly Online. Speak with local agents about Idaho Springs CO Home Values. We will provide a detailed home value, pre-listing advice and offer a free staging consultation for all listings. Use our advanced online search tools to see the sold and under contract homes in your area. Check our Idaho Springs local market trend reports below. Our market updates show the area appreciation, the average sold prices, the percentage of sold price to list price, average days on market and much more. Mike Lies and his team at Gold Compass Real Estate is your Idaho Springs CO real estate agent whether you are simply curious about the values of real estate in the Foothills area or are further along in your home selling or buying process and are ready for the services of a professional realtor, Gold Compass Real Estate can meet your needs. We provide home guidance that you can trust! We specialize in local real estate including Idaho Springs and homes for sale in all of the Foothills. We offer Idaho Springs MLS listings directly on our site as well as all of the Denver Metro listings. View the most up-to-date information from the MLS on our user friendly site. Our Idaho Springs CO real estate agent can help educate and guide you in picking the best area for your family. To schedule your tour of For Sale Home in Idaho Springs CO or to request a full market analysis if you plan to sell your home, call Gold Compass Real Estate at 303-325-5690.